Dual beam focused ion beam/scanning electron microscope (FESEM). 4"-compatible load lock permits quick sample exchange. 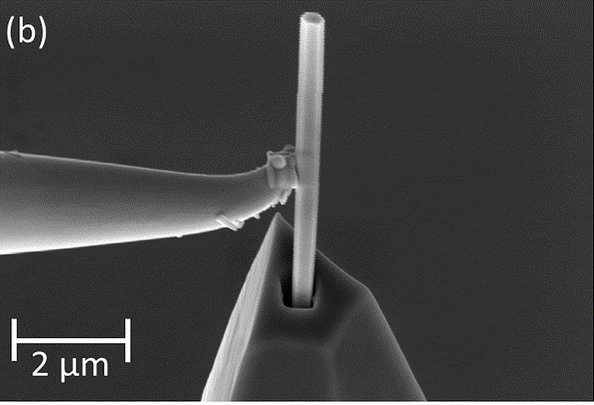 Gallium nitride nanowire being mounted onto an atomic force microscopy tip with a micromanipulator in a NIST focused ion beam tool. FIB cross-section of a Josephson junction used in quantum voltage standards. Images like this one are used to identify defects from the fabrication process and suggest corrections. Image sequence of a Josephson junction device as a focused ion beam tool removes slices. Credit: Anna Fox. Fabrication sequence for a TEM lamella of a row of GaN nanowires grown by selective epitaxy on silicon. Specimens like these allowed identification of polarity inversion domains at the regrowth interface , which in turn lead to Energy Dispersive Spectroscopy (TEM-based) and atom probe tomography that identified Al and O contamination as the cause. Modification of the cleaning procedures just before regrowth eliminated the inversion domain defects. Epitaxial regrowth of GaN has applications in nanowire LED production and AC-DC and DC-DC power converters. Image sequence during focused ion beam preparation of a row of GaN nanowires for transmission electron microscopy. Credit: Paul Blanchard.